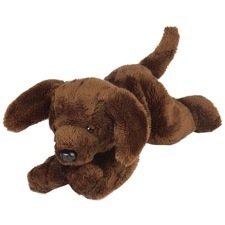 This is one big Chocolate Lab plush, almost 16 inches long while lying down! Purchase one of our Chocolate Labrador Purses and fill it with flavorful goodies for your little girls next big day! Approximate item size is 7 inches. Treat your little girl like the princess she is with this brightly colored Whimsy Tote Sassy Pet Sak complete with strap and the sweet Plush Chocolate Lab Stuffed Animal inside. They fit ladies sizes 9 through 11. Made from 75% acrylic and 25% nylon, the Chocolate Labrador sock is easy to pull on and off. Finest quality floppy plush stuffed lab puppies from Douglas. Find plush Chocolate Labs for bid at Ebay.